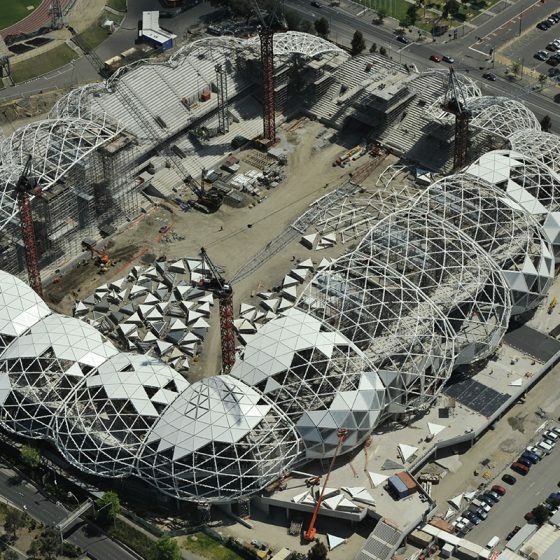 With its distinctive geodesic dome roof and its rectangular playing field, AAMI Park has reinvigorated Melbourne’s world famous sporting precinct, attracting new international teams and sporting codes to this already sports mad city. The $267.5 million, 30,050-seat stadium was built on the historic Edwin Flack field, after an agreement between Melbourne Victory and the Football Federation of Victoria to extensively refurbish the grounds, expand the seating capacity and build a state-of-the-art stadium to attract soccer, rugby union and rugby league fans. 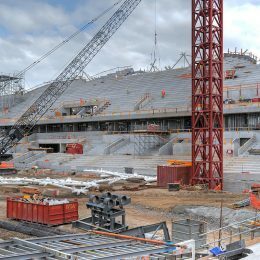 The partially covered stadium boasts a bioframe design that eliminates the need for pillars, walls or other support structures, offering spectators unobstructed views of the action. 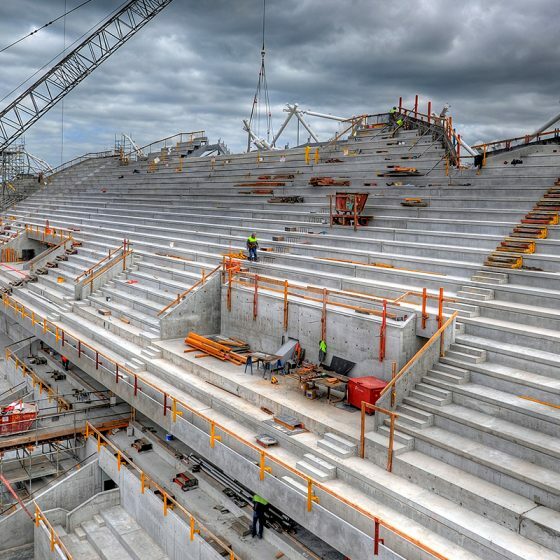 The stadium called for extensive use of precast seating plats which were supplied by Westkon Precast. 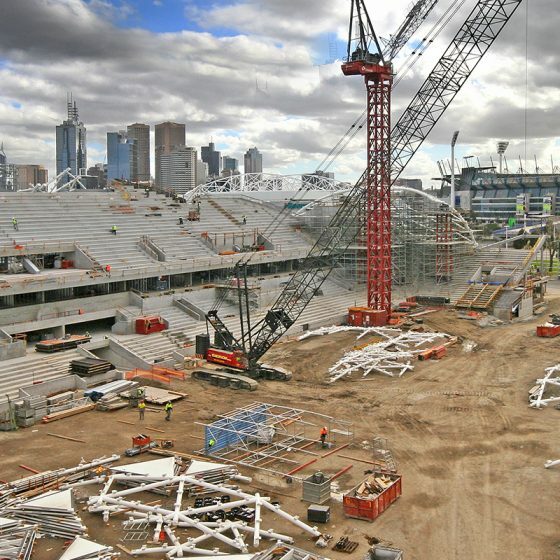 Westkon had experience on sporting venue projects, and moved onto the job after completing the refurbishment of the nearby Melbourne Cricket Ground. The standard pre-stressed seating plats for the project were manufactured using specialised proprietary hydraulic self-stressing standalone moulds. Two other specialised plat moulds were also used. The first was the mould for the pre-stressed double plat seating units that also form the front row of the upper grandstand. This purpose-built mould was built in the ground. These double plats have a mass of over 20 tonnes per unit. The other specialized moulds were the pre-stressed cantilevered plats that were created to form both the upper back rows of the stadium and the all-important foundation of the stadium’s unique roof profile. This was a complex challenge because the plats themselves formed the curves that ran in line with the roof detail. 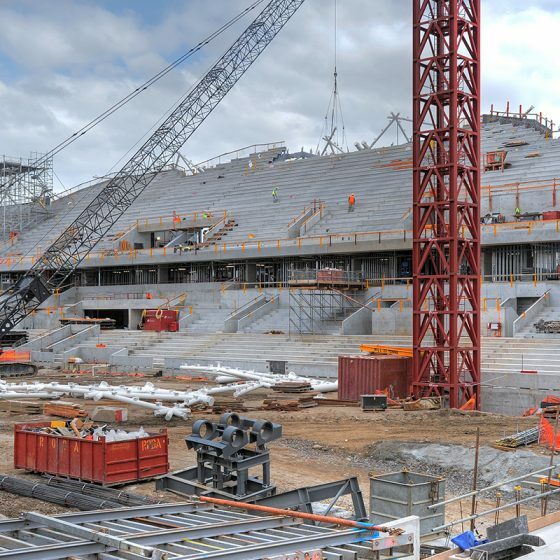 The specialised seating plat moulds required extensive planning, time and resources to set up. The casting schedule meant producing 12 plats a day, sometimes up to 20 tonnes each. When there were delays with construction on site, the plats had to be stored – not an easy task due to their shape which was not conducive to stacking. At one point, a total of 15 acres of factory space was dedicated to storing the plats for the project at Westkon’s Sunshine and Melton plants. The slew of awards the project has received since its completion is also testimony to its success.